This journal offers an international forum for a wide range of contemporary theoretical, clinical, professional, and cultural concepts of psychoanalysis, and for presenting related investigations in allied fields. Founded in 1941, The American Journal of Psychoanalysis (AJP) presents psychoanalytic papers from all schools of thought that address the interests and concerns of scholars and practitioners of psychoanalysis, and contribute meaningfully to the understanding of human experience. 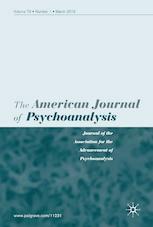 AJP is an international forum for communicating a broad range of contemporary theoretical, clinical, professional and cultural concepts of psychoanalysis and for presenting related investigations in allied fields. Affiliated with the Association for the Advancement of Psychoanalysis, AJP publishes original papers; book reviews; film reviews; reports on the activities of the Karen Horney Psychoanalytic Center; comments; and special issues focused on a single topic.